Televisions are getting thinner and thinner, but the basic principles of physics aren’t. Which means that the ever-thinner speakers in said TVs are kind of crap. An add-on soundbar is a quick and easy way to remedy this. 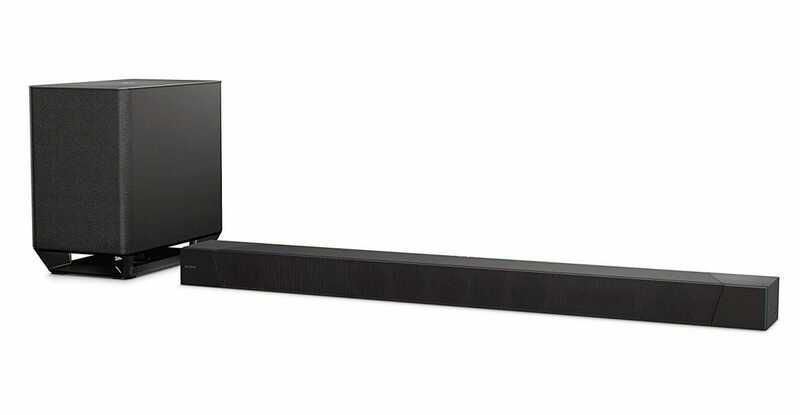 Soundbars aren’t an effective replacement for a full surround sound speaker array with accompanying reciever, but even the cheapest ones will sound better than the wimpy speakers in your TV, especially if it comes with a separate subwoofer. And with televisions and entertainment centers now more than ever a centerpiece of some living room decor, that extra bit of sleek styling might be more important than sheer watts or surround capability. Some of the more advanced designs can accommodate both, connecting wirelessly to subwoofers and optional satellite surround speakers, giving you the best of both worlds. We’ve selected the best models on the market for a straightforward TV sound upgrade, the best for those on a budget, the best for users who want an all-in-one surround sound option, the best for the style-conscious, and the best for those who want the sleekest-looking sound bar they can get. You wouldn’t think that this Yamaha bar is at the head of the pack based on its unassuming looks, but great sound, a solid collection of features, and a reasonable price make it the easy pick in a very large selection. Six woofer and tweeter drivers offer room-filling 100 watts of sound with an extra 100 watts on the wireless subwoofer. The 4K HDMI-in and out means your TV can use the ARC standard for easy control. Bluetooth, aux-in, and optical are also supported, as well as Dolby’s DTS Virtual:X surround standard (with a firmware upgrade). The latter probably isn’t worth worrying about for stereo speakers—see our surround pick below for something better—but this model packs an incredible amount of value into three hundred bucks. At only half the price of the Yamaha model above, this smaller Vizio manages to cram in most of its important features. That includes a wireless subwoofer and HDMI ARC support—neither of which is a given at this price point. The 2.1 speaker array probably isn’t enough to rattle the windows in a large room, but as a budget-conscious upgrade for your TV it’s more than serviceable. Bluetooth and optical connections are also included, along with old-fashioned RCA and aux inputs for less sophisticated setups. The bar has an IR remote, but no screen, so it might be a little tricky to manage features like Dolby’s DTS TrueVolume for quieting annoying commercials. 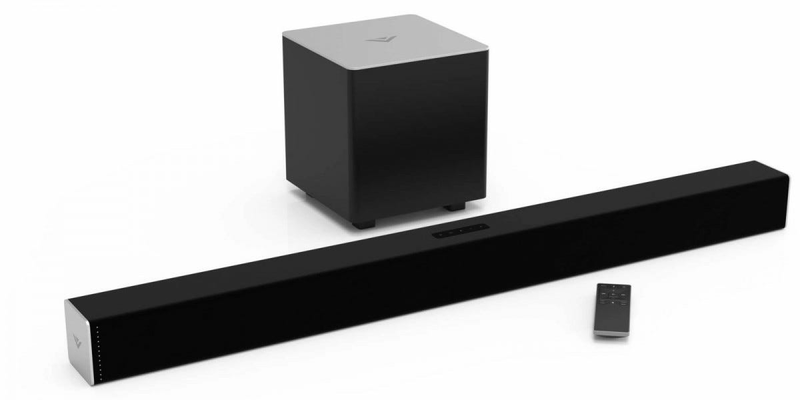 Surround sound from a front-firing soundbar is something of a misnomer—it’s only “virtual” surround, because it’s attempting to bounce sound off of the surfaces of the room to fool your ears into thinking you have multiple speakers. But Sony’s HT-ST5000 does a better job at this than most designs, since it uses top-firing speakers to bounce that Dolby Atmos sound off the ceiling. That’s a much more reliable method than side-firing speakers, since the geometry of your living room might not be an ideal parallelogram. Since this is also one of Sony’s most high-end models, it includes tons of other features, too: 800 watts of bone-shaking power from nine different drivers and the wireless subwoofer, three different HDMI inputs (all supporting 4K HDR, one supporting ARC), the standard Bluetooth and aux connections, W-Fi for Chromecast and Spotify Connect functionality, and even wired connections for Ethernet and USB. Note that this is a monster bar at almost four feet long; if you don’t have at least a 55-inch TV to go along with it, you’ll be doing it something of a disservice. 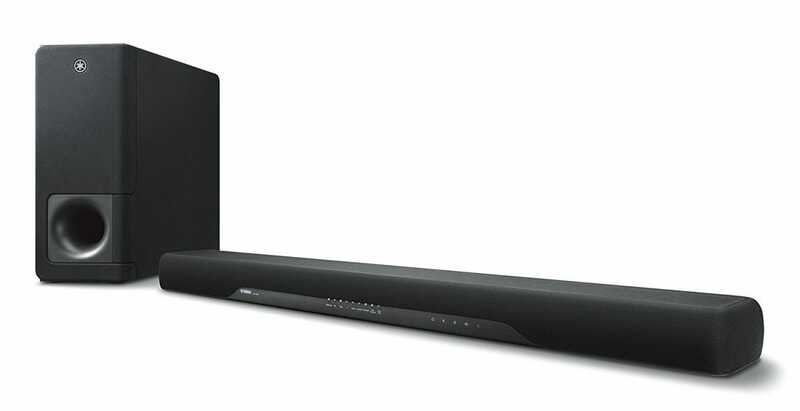 If your decor demands a sound bar that blends in rather than stands out, this Samsung offering will oblige. In addition to its subtle curve, the bar is designed with either a single-spot wall mount or a piggyback mount for the TV already on your wall—no new hardware required. The all-in-one aesthetic crams no less than nine drivers with integrated distortion control into the package, making it serviceable without a subwoofer. 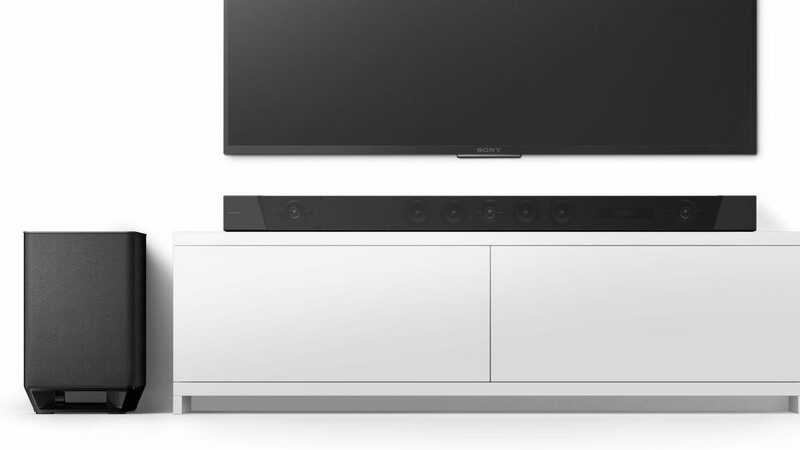 They’re arrayed in a 2.1 layout, but if you want to add on more capability, the bar is compatible with Samsung’s wireless surround speaker standard. It can connect to either Wi-Fi or Bluetooth (including a dedicated wireless connection for some Samsung TVs). 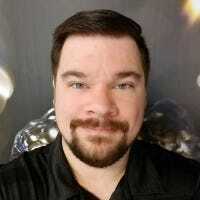 The usual bells and whistles are along for the ride, including HDMI-ARC and simpler connections. Those who’ve already invested in multi-room smart speakers with integrated digital assistants will probably want their soundbar to play along. Sonos knows a thing or two about connected audio, and the Beam knows even more, thanks to integrated support for Amazon Alexa and Apple AirPlay, with Google Assistant and Siri support coming in a future update. The integrated microphone means you can speak directly to the bar and get your assistant of choice to answer. Wi-Fi connections to other Sonos speakers can function in the standard fashion or as a surround sound array. Aside from the ARC HDMI port, optical and Ethernet connections are hiding around the back. And as a nice bonus, it comes in either black or white.